This rich and exploratory tour offers an intriguing overland journey from Hanoi to Angkor Wat via some of the most off-the-beaten-track and beautiful regions in Southeast Asia that will surely captivate even the most jaded traveler. Starting out in historic Hanoi, we will explore the lively Old Quarter of the city and some of the city’s most famous sights before we travel to the majestic Halong Bay to experience time aboard a traditional junk visiting some of the lesser-known areas within the bay. Moving on to Tam Coc in Ninh Binh from where we will swing west into the striking mountain landscapes around Mai Chau, our base for some trekking amid the ricefields and villages of the White Thai minority. We later will cross the mountainous border with Laos to explore the infamous Vieng Xai Caves, which served as a secret base for the Pathet Lao leadership during the war. From Sam Neua we will have a wildlife adventure in Nam Et National Park, before a stunning boat cruise on the Nam Ou River to Luang Prabang. Later we will fly to the southern Laos city of Pakse, where we spend a few days at Tadlo and Don Khong before crossing border to Cambodia and kayaking along the bird-filled wetlands and on to the UNESCO World Heritage Site of Preah Vihear before ending our time with a couple days in Siem Reap, the land of the temples and gods, where we will travel on bicycles and motorbikes around various jungle temples to areas little-visited by travelers. Today upon arrival at Hanoi’s Noi Bai International Airport you will be met by your guide and transferred to your hotel. The remainder of the day will be at your leisure. Overnight in Hanoi. We will start off our tour with a full day of exploring around historic Hanoi, where we will go to Ba Dinh Ba Dinh Square to see Ho Chi Minh’s Mausoleum, which was constructed from materials gathered from all over Vietnam between 1973 and 1975, and where we will view the body of Ho Chi Minh, which is preserved in the cooled, central hall of the mausoleum, protected by a military honor guard. If our timing is right, we might also catch the changing of the guards outside Ho’s mausoleum – which rivals the British equivalent at Buckingham Palace. Next we will take in Hanoi’s famous One-Pillar Pagoda, constructed in 1049 to resemble a lotus blossom, before continuing to the Temple of Literature, which dates back to 1070 and is dedicated to the cult of Confucius, and visit the Museum of Ethnology where we’ll learn about the fascinating cultural diversity of this ancient land. After lunch we will visit the infamous Hoa Lò Prison, known as the “Hanoi Hilton”, which was a prison used by the French colonists in Vietnam for political prisoners, and later by North Vietnam for prisoners of war during the Vietnam War. Later we will pay a visit to the National Museum of Vietnamese History, which is housed in an elegant, ochre-colored structure built between 1925 and 1932. From there we will take a cyclo ride through the Hanoi’s Old Quarter, a network of narrow alleys and shop houses also known as “The 36 Streets.” This is a wonderful place to watch the local life, and peruse items from fabrics to crafts to exotic medicines. Later in the afternoon we will enjoy a traditional water puppet show, a fascinating art form that originated in northern Vietnam. Overnight in Hanoi. 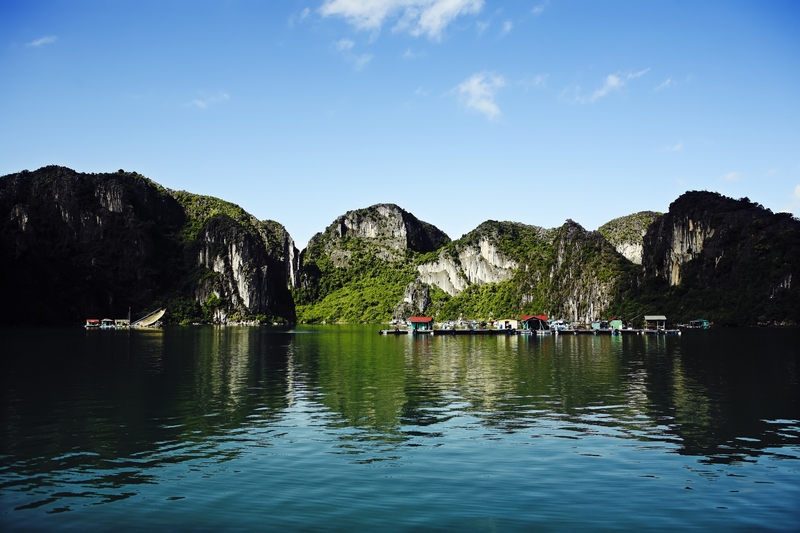 Today we embark roughly 3 ½ hours east to one of Vietnam’s crowning jewels, the UNESCO-listed, Halong Bay. Once there we will board an overnight cruise and set sail to Bai Tu Long Bay, which is much less touristed than Halong Bay and part of Bai Tu Long National Park, where we will enjoy the azure waters of this magical bay where thousands of sculpted limestone islands rise from the waves, passing the picturesque area around Mat Quy Islet and Am Islet. 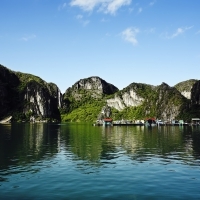 In the mid-afternoon, we will visit the Cua Van fishing village, which is surrounded by majestic limestone mountains, and enjoy a pleasant bamboo boat row through the village among floating homes, as well as visit the stunning TienOng Cave, which has only been open to tourists since 2010. Back on board our vessel, we will spend the rest of the evening enjoying the sunset and relaxing while taking in the views. Overnight on board the Halong Bay. Today we will welcome the morning with stunning scenery while taking in the sunrise over the sea and you will have the opportunity to enjoy an optional Tai Chi class. Along the way we will stop for a swim on the white sand beaches of Soi Sim or you can join our chef for a Vietnamese cooking demonstration. Later we will carve our way through Bai Tu Long Bay and have excellent photo opportunities passing Peal Farm, Phao Dai islet, Tam Cung cave, Hon Xep islet and Dau Moi temple. On arrival at the pier, we will then begin our roughly 4-hour drive south to Ninh Binh. In the morning we will board small sampans (traditional flat-bottomed Chinese wooden boats) for a scenic two hour cruise throughout an entire area that is known as the ‘land version’ of Halong Bay for its beauty. We will navigate through numerous waterways along the beautiful rural landscape of limestone cliffs and bright-green rice paddies to the stunning long, dark tunnel-caves of Tam Cốc. Back on shore we will head through the countryside to Hoa Lư, the ancient capital of Vietnam during the 10th and 11th centuries, and visit the Đinh Bộ Lĩnh and Lê Đại Hành dynastic temples. Next we will stop off at a Van Lam village for lunch in a local restaurant before arriving in Mai Châu where we will spend the evening in a stilt house. 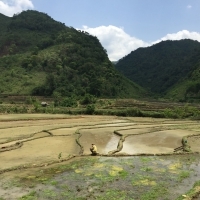 Venturing out today our first stop will be to explore and witness the daily lives of the hard-working and friendly ethnic villagers of Pom Coong and Lac, where we will take a light walks along the mountainous rice fields. The villagers specialize in weaving brocade products and are happy to show visitors their skills. The village is operated as a community co-operative and set up by the people themselves. Later we will head back to Mai Châu for dinner and an evening to rest at leisure. An active and fascinating day awaits us this morning after breakfast as we will leave the gorgeous Mai Chau Valley and travel along beautiful mountain roads to the remote Vietnam/Laos border crossing of Nam Xai and Na Meo. The road to the border climbs into areas of striking karst scenery and there will be several photo opportunities along the way. 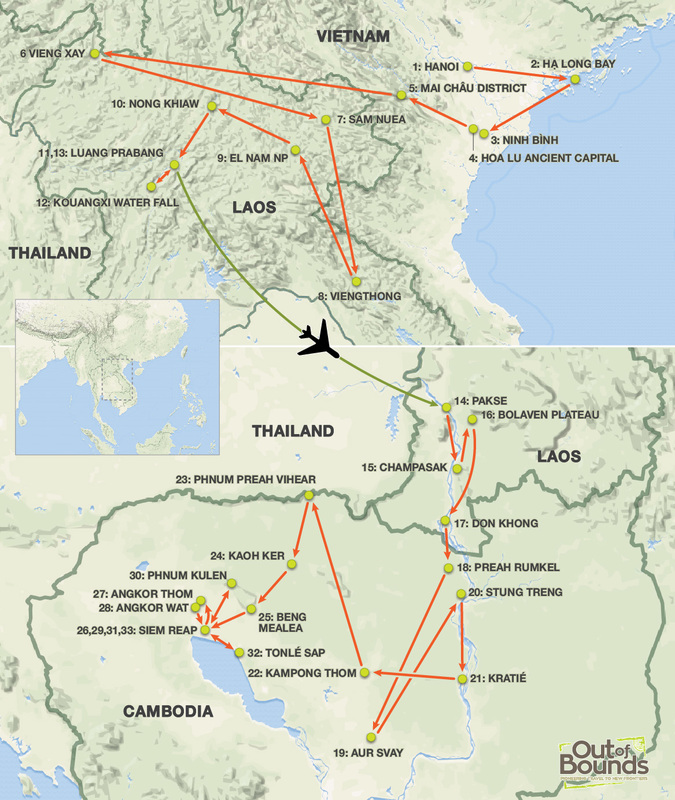 After completing immigration formalities and changing vehicles, we will continue our journey into Laos, where after a 2-3 hour drive we will arrive at the remote outpost of Vieng Xai District, an infamous place during the Secret War in Laos, a sort of Cu Chi Tunnels cast in stone. Overnight in Vieng Xai. After breakfast, we travel to the Pathet Lao revolutionary headquarters at Vieng Xai, also known as the “City of Victory”. Set in limestone hills that are riddled with caves, this is where the senior communist leadership spent their time directing the war in the 1960s and early 1970s. Long off-limits to tourists, they are now an adventurous destination for those with an interest in the secret war in Laos. The caves are stunningly set amid towering cliffs and we will visit the most important caves here including Tham Souphanouvong, which originally housed the ‘Red Prince’, and Tham Than Kaysone, which was used by the first communist President, Kaysone Phomvihane. On the way back to Sam Neua, we stop at a Hmong village to learn about the local way of life in this remote part of northeast Laos, and also visit the well-hidden Tat Nam Neua waterfall, which is 80 meters high. Overnight in Sam Neua. Today we will begin our travels with a scenic 2-hour drive through the forested terrain to the ethnic Khmu village of Ban Son Koua where we will board a long-tail boat and cruise for roughly 1½ hours on the Nam Nern River to the Nam Et Phou Louey headquarters where we expect there to be plenty of active birds along the route. Once at the headquarters, we will enjoy a lunch prepared by the villagers, and learn about conservation and management from the park staff. Around mid-afternoon we depart for a night safari, stopping along the way at a salt lick, where your local guide, a skilled hunter and tracker, will identify animal tracks. After relaxing at a campfire and enjoying a BBQ dinner, we will float down the peaceful river quietly while our local guide looks for wildlife such as deer, otters, porcupine and owls along the way by flashlight. Approximately 2-hours later we will arrive back at the park headquarters to spend the evening in traditional Lao-style huts in the forest. This morning we will rise early to explore the jungles of Nam Et with local guides that will be teaching us about medicinal plants and explain the history of the area. After breakfast we take the relaxing boat ride back to Ban Son Koua, making a stop along the way at a prime bird watching spot. Later we will continue to the sleepy village of Nong Khiaw, passing through breathtaking scenery along the way, and arrive by the early evening. We start our busy day with a minivan ride past the town of Nam Bak, that is well know for orange farming activity, before arriving in Pak Mong where we will then take a boat to cross the famed Mekong River to visit the two mysterious caves of Pak Ou, which are set in a limestone cliff facing the Mekong and crammed with thousands Buddha statues of various shapes and sizes. We then will continue our cruise down the river to visit Ban Sang Hai, where the specialty of village is the production of rice wine and weaving’s. 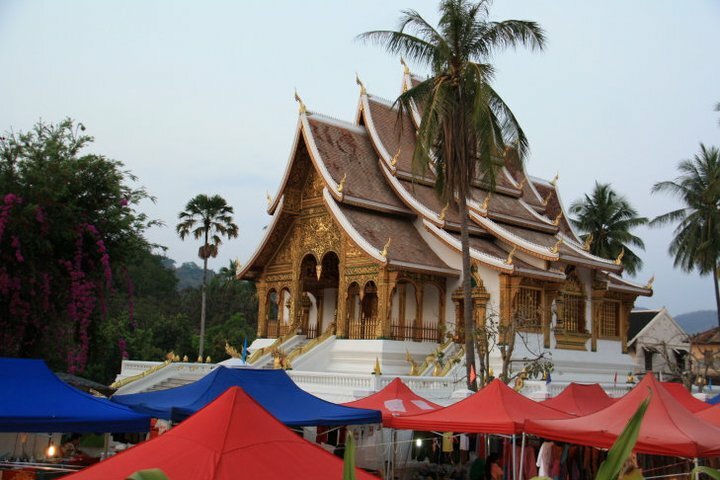 Later we will arrive in the wonderful, UNESCO-listed town of Luang Prabang, which is a true highlight of a visit to Laos and Southeast Asia and oozes with charm. Once we’ve checked into our hotel we will stroll the town and have dinner at a traditional restaurant before enjoying the rest of the evening at leisure. We begin our further explorations of Luang Prabang with a visit to the Royal Palace Museum, which gives a good overview of the local history. 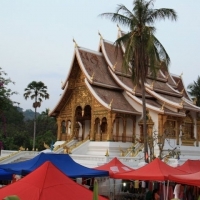 We then will pay a visit to the country’s most historic and enchanting temple of Wat Xiengthong and Wat Visoun, one of the most celebrated temples in Laos. A magnificent structure, this is the quintessential Luang Prabang temple with a graceful sweeping roof that reaches almost to the floor. One of the only temples not to have been destroyed by successive invaders, this was originally constructed in 1560. We visit the spiritual sim, the focal point of the temple, as well as viewing the ‘tree of life’ mosaic on the rear wall. We also take a look at the impressive golden royal funerary chariot. In the afternoon we visit the excellent Arts and Ethnology Center, the textile villages of Ban Xangkhong and Ban Xienglek, before ending our day with a visit to the top of Mount Phousi, where we can enjoy 360 degree across the city and its many temples and watch the sunset. This morning we will travel south on the Mekong River to a traditional pottery village where we will explore the village and learn how they make traditional clay pots for rice wine storage and other uses, and may have the opportunity to have our own pottery class with one of the master potters from the village. We then will continue downriver to where we join our vehicle for the rest of the journey to the Kuang Si Falls. At the falls, we will walk through the forest, passing pool after pool of turquoise waters, white limestone rock and lush green forest and admiring the beautiful series of waterfalls that spill out into the jungle. There will be several excellent pools along the way for a refreshing and cooling swim. After a relaxing picnic lunch, we will continue upwards to the top of the main falls before later in the afternoon returning to Luang Prabang, stopping at a minority village along the way to learn about their traditional way of life. After breakfast, transfer to airport for the short flight to Pakse. On arrival at Pakse, we will transfer to the pier to sail down to Champasak along the Mekong to visit the fascinating pre-Angkorian ruins of Wat Phu, one of Southeast Asia’s most dramatically situated temples. After some time exploring Champasak, which was once the capital of a Lao kingdom and today is full of traditional wooden houses and colonial-style palaces, we will explore nearby Wat Phu and the intriguing Khmer ruins, which are perched at the base of Mount Phu Kao. Wat Phu was recognized by UNESCO in 2001, and this archaeological site of Khmer civilization dates back to the 5th century, predating Angkor Wat in Cambodia. In the afternoon, we will head directly to the Boloven Plateau area to observe the locals and their way of life as they make traditional tea and coffee. The Boloven Plateau is known for its cooler temperature being located high above the Mekong Valley. Rivers run off this high plateau in all directions and then plunge out to lush forests along in a series of spectacular surging waterfalls. The scenery around Tad Fan waterfall is spectacular with twin waterfalls plummeting into a deep gorge surrounded by flourishing vegetation. Overnight in Boleven. This morning we head out towards Khong Island, where on the way we make a short detour to visit Pha Suam waterfall, which stands about 6 meters high and flows all year from the Houai Champi River. Later will walk around the ethnic minority villages of Lao Teung. 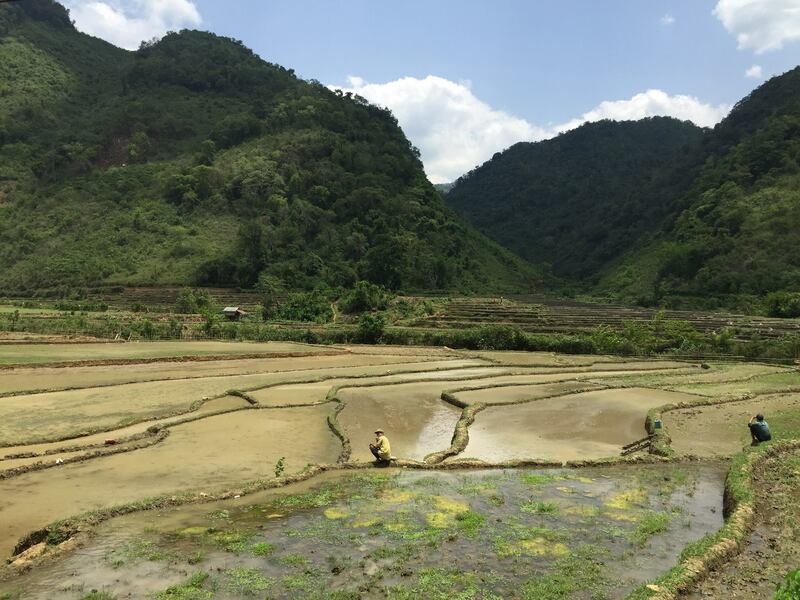 Traveling throughout the Plateau, we will discover some of the lesser-known areas of Laos and observe the wild beauty of the southern region where we will see the cultivation of rich coffee, tea, cardamom, bananas, and other crops that can be seen en route. We later continue our journey by road to the riverfront town of Ban Nakasang before taking a long-tailed boat to the tropical island of Don Khone, the largest island in the south Mekong River region known as the 4000 Islands, which one of the most scenic areas in all of Laos. This evening we will attend a Baci Ceremony; the purpose of this ceremony is to wish luck on a person or event. It is held when people are promoted on their work, move into a new house, start a new jobs and may other reasons. Unique to Lao culture, a Baci involves transferring good luck through bless strings that are tied to one wrist. The strings must stay attached for at least three day for the luck to remain. Baci will start at local Lao house followed by traditional Lao dance show. Overnight in Don Khone. Following breakfast, we will set out to enjoy visit the surrounding countryside of Don Khone where we will visit the Liphi Waterfall or “the Corridor of the Devil”, and have the opportunity to ride a local tuk tuk. We then will return to the mainland to Ban Nakasang and drive south to visit Khone Phapheng Falls. Khone Phapheng is considered the largest waterfall by volume in the Southeast Asia and is truly an impressive sight near the Lao-Cambodian border, which is teeming with wildlife making this area one of the most breathtaking destinations in Laos. After we will drive to the Laos/Cambodian border at Dong Krolor, where we will complete formalities and enter Cambodia and head for Anlong Cheuteal, where we will travel on community boat up the rapids to view closely the Sopheakmith Waterfall, which marks the Lao border. Continuing on the road there should be opportunities to see Cambodian-Laos fisherman en route where we can learn about their unique fishing style. On arrival in Preah Rumkel we will be welcomed by the leader of Preah Rumkel Community Base Ecotourism and overnight in a homestay. This morning we will enjoy a short boat trip down to O’Svay where we will start our paddling tours to explore the remote flooded forests of the Mekong in the extremely remote Ramsa wetlands. The wetlands stretch south along the Mekong River from the border with Laos to Stung Treng, in the northeast of Cambodia. Only accessible by boat, it is one of the most bio-diverse river regions in the world and a haven for critically endangered mammals, birds and fish and is truly a photographer’s dream. We will quietly maneuver our way downstream on the lookout for wildlife for a couple of hours before reaching the only village on that stretch of the the river, Veun Sien, where we will rest our kayaks for lunch break and wander around the village. If we are all feeling up for it, we will then continue our kayak tour of the wetlands for another hour or two so that we may fully take in this special place before boarding our boat back to O’Svay and traveling by van back to Stung Treng. If timed right, we may arrive just in time to view beautiful sunset over the river on Chinese-Cambodian Friendship Sekong Bridge. Overnight in Stung Treng. We leave Stung Treng this morning and travel on the recently paved Highway 7 a couple hours south to Kratie. En route we will visit the famous 100-Column Pagoda and learn of its fascinating history as a place of pilgrimage for residents of Kratie. Afterwards we will visit the Mekong Turtle Conservation Center and see one of the most endangered Mekong softsell turtles, which were only discovered along this area of the Mekong in 2007. The project looks after baby turtles until they become big enough to protect themselves from big fish and be self-sustaining. Later we then Kampi, one of the many deep pools where the rare river dolphins gather to feed, were we board a local boat and cruise out into the Mekong for guaranteed viewing of these gentle mammals. Viewing is guaranteed. After enjoying an hour or so of dolphin viewing, we will travel to the charming town of Kratie and will stop at the hilltop temple of Phnom Sombok to watch sunset over the Mekong. Finally, we will take a local ferry across the Mekong River to Koh Trong for a 9km cycling loop around the island where we will see farms of grapefruit and other seasonal fruit and vegetable as well as a floating village. Overnight in Kratie. After breakfast, we continue to Kompong Thom, stopping first en route at Chhlong village to admire one of the oldest wooden houses of Cambodia. Arriving in Kompong Cham, we visit Wat Nokor, which is also called Nokor Bachey Pagoda, and is an 11th century Mahayana Buddhist shrine made of sandstone and laterite with a large reclining Buddha and numerous alcoves containing Buddha images. We continue to Phnom Pros (“Man Hill”) and Phnom Srei (“Woman Hill”). According to local tradition, two teams of men and women competed to build a stupa on the summit of each hill before dawn. After being tricked into thinking that daybreak had already come, the men lost the competition and, as a result, forever after had to be the ones to approach the women for their hands in marriage. Overnight in Kompong Thom. This morning we will go to the archaeological sight of Sambor Prei Kuk, which is dotted with hundred Pre-Angkor styled temples. The site, part of the Chenla Kingdom, includes an area of nearly 1000 acres enclosed by double walls, and hundreds temples and towers; its construction predates Angkor Wat by several centuries. We then continue to Preah Vihear, where our journey takes us through the jungle and to a local village where we will admire some beautiful scenery along this route as that is little-seen and very wild. Our drive then takes us up to Preah Vihear, which sits at the top of the Dangrek Mountains. Preah Vihear is known as the Temple Mountain and was built at the beginning of the 10th century as a Hindu temple dedicated to Shiva. The temple had further works added to it by the following three kings. The temple today is still a Hindu site, but Buddhist Monks pray at the temple to the Gods. The temple area consists of three stories surrounded by two galleries. Overnight in Preah Vihear. We now continue our trip to one of the most storied and interesting sites in all of Asia: Siem Reap. Our first stop along the way will be at Kaoh Ker, which is a group of many temples in the forest, about 150km from Siem Reap. These were built when Cambodia was ruled by two kings, and Koh Ker was briefly one of the two capital cities, during the 1st half of the 10th century. Some of the temples are still covered with tropical jungle. We then arrive at Svay Leu Village and start trekking into the bamboo forest from the village to Peuong Komnu, a series of Angkorian reliefs carved into the southern cliff of Phnom Kulen, where the quality of the work and their preservation is truly remarkable. It is one of the true undiscovered tourist sites in Angkor area. We will also visit Beng Mealea, which is an overgrown ruin 90 minutes outside of Siem Reap. It is massive, but little known and it is largely untouched. Besides this temple, we see a small quarry where sandstone was cut to build the temple. After a couple hours touring this hidden gem, we will head into Siem Reap and overnight. This morning we will hop on our bikes to visit the World Heritage areas around the famous temples and ride among the jungle and to explore some of Angkor’s most beautiful temples. We will visit the West Gate of Angkor Thom – which is undiscovered by mass tourist; see the South Gate, Bayon Temple – unique for its 54 towers decorated with over 200 smiling faces of Avolokitesvara; and the Baphuon temple lying just to the north of Bayon a pyramidal representation of mythical Mont Meru. We will also visit the Phimeanakas temple, which was built in the 10th century as a Hindu temple, before making our way to Ta Prohm, of the “Tomb Raider” fame. Ta Prohm has been all but abandoned to the elements, a reminder that while empires rise and fall, the riotous power of nature marches on, oblivious to the dramas of human history. Left as it was ‘discovered’ by French explorer Henri Mouhout in 1860, the tentacle-like tree roots here are slowly strangling the surviving stones, man first conquering nature to create, nature later conquering man to destroy. We continue to the famous temple: Angkor Wat. Angkor Wat is a World Heritage Site since 1992, famous for its beauty and splendor. Angkor Wat features the longest continuous bas-relief in the world, which runs along the outer gallery walls and narrates stories from Hindu mythology. To reward ourselves after a busy and interesting day, we can enjoy an optional 1 hour foot massage and after dinner later the thriving nightlife area for a relaxing drink before exploring the Angkor Night Market. Up early this morning at 7am, we will depart our hotel on the drive to Phnom Kulen, which is considered the most sacred mountain in Cambodia. It was here that Jayavarman II declared himself a ‘god-king’ and gave birth to the Khmer Empire in AD 802. Once we arrive at the Kulen Mountain near the Preah Ang Thom pagoda, we will meet our motodup (motorbike) drivers who will take us for the next few hours around the mountain. As we ride as a passenger around the mountain we will be on bumpy country roads and tracks, over volcanic rocks and occasionally through shallow streams — a truly memorable and enthralling experience! Our first stop is at Poeng Tbal where a riverbed reveals a well preserved stone with details of Shiva and Vishnu and the rocks carvings of Ganesh and wise men. Another short ride further leads to one of the most important sites in all of Cambodia: a small pedestal that is set on top of three tiered pyramid temple called Prasat Rong Chen. While there is little to see of it remaining today, the significance is huge: it is at this point that Jayavarman II declared himself the absolute monarch of the Cambodian Kingdom and announced independence from Java. The linga has been stolen from the pedestal but as you stand here take a few moments to contemplate that the Khmer Empire began at this very spot. While the sites on the mountain have been known for many years to the Khmer people and those living on the mountain, it has only recently confirmed that Phnom Kulen was the location of Mahendraparvata. It was only discovered in mid-2012 as a result of Australian archaeologists using laser mapping equipment flying overhead. Mahendraparvata served as a huge service city for Angkor, a completely unrivaled urban landscape in the pre-industrial world. Later we will head across more paths to a modern temple with colorful statues and a scenic view and enjoy a simple, packed lunch at the temple dining room. Continuing on after this short break we will go to Bat Cave, which with the help of torches you can enter for a few hundred meters and see a modern shrine. Both the cave and the temple attract many pilgrims to the area. A short distance on is Srah Damrei (or Elephant Pond). The life-size stone elephant which served as a guardian for the mountain. There are also smaller statues of lions, a cow and a frog that will also impress. Heading back to the starting point we will see some more stone carvings at Damrei Khrap (Kneeling Elephant). The motodup adventure then finishes at Preah Ang Thom. 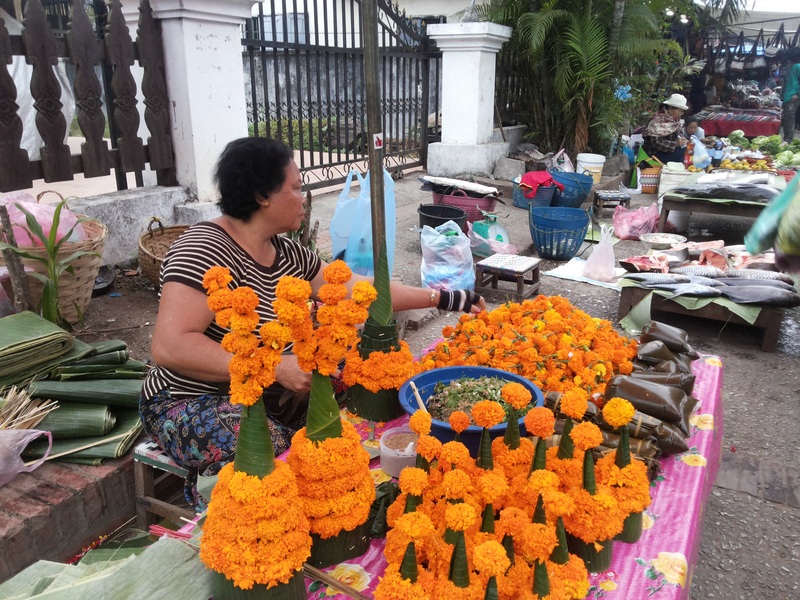 On our return to Siem Reap we will make two last stops. The first being a short visit to see the River of a Thousand Lingas, where hundreds of the linga carvings can be seen on a stretch of the river. After we will visit Kulen Waterfall where you can take a refreshing bath after a very active and exciting day. 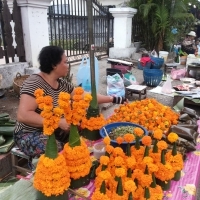 We will then return to Siem Reap and overnight. This morning we will head out of Siem Reap for the Tonlé Sap, driving down the eastern side of the lake. Arrive at Kompong Klaing, a remarkable and photogenic village built entirely on stilts, where we will have time to explore the various houses, school and shops before boarding our private boat to cruise along a short tributary, passing fishermen and children playing in the shallow waters, before arriving at a typical floating village where you may either disembark or continue cruise among the waterways. At the head of the tributary we will continue out on to the ‘Great Lake’ and continue traveling north to Kompong Phluk; a ‘flooded forest’. Accessible only during high water, you’ll pass through the tree tops while seated in the boat. Nearby is a fishing village where we will also learn more about the traditional methods used for generations. Returning to the mainland, we will meet our driver and return to Siem Reap for a final farewell dinner as a group. Overnight in Siem Reap. Transfers can be made to the airport for your onward flight.